Before the release of the PRM Extension Module, our Programmable Relay PR200 had been a fixed mini PLC with the total number of 22 inputs and outputs. It is good to have a compact device but the performance and flexibility also often matter. Modularity is the key to meeting the growing requirements of your control system. With the PRM Extension Modules, the PR200 is not a fixed PLC. 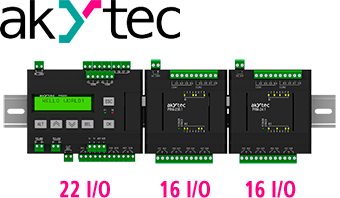 Now it is a modular expandable device that can have up to 54 I/O-points. The PRM module is equipped with 8 digital inputs and 8 digital outputs. The inputs can process signals received from sensors with a switch contact output or a PNP open-collector transistor output. The outputs serve as normally-open relays and can be directly connected in-line with the desired control or indicating device. They are rated for up to 5 A, 250 V AC and up to 3 A, 30 V DC, regardless of the input voltage. If communication with the PR200 has been interrupted, the outputs of the PRM module take values previously set by the user. This feature is called output safe state. The modules are connected to the compact mini PLC PR200 (hereinafter ‘base device’) via an internal bus. This bus is implemented as an SPI interface and a short flexible flat cable consisting of 10 wires. The internal bus enables quick and easy-to-configure connection of the PRM modules to the base device. You need just a couple of clicks to add a PRM module to your project in akYtec ALP, the programming software for the base device. Unlike a Modbus extension module, using a PRM unit you don’t need to mess with Modbus registers and functions. Once a PRM module has been added to the project, its inputs and outputs are available for direct linking with the variables and functional blocks present in your project. The power supply requirements of a PRM Extension Module differ depending on the device variant. It can be either 24 V DC or 230 V AC. The 24 V device supports debouncing filter on its inputs that can be set in the range of 0…255 ms.
Due to its own power terminals, each PRM unit can be powered from a separate power supply. As a result, the base device and extension modules of different supply voltage can operate together. The power supply, input and output terminals are galvanically isolated from internal circuits with isolation rating up to 2830 V, which provides additional device reliability and user safety. The device has a compact enclosure that can be easily snapped onto a 35 mm standard DIN-rail without the need for any tools. The enclosure form and depth allow the PRM to be mounted not only into a control cabinet but also a distribution board. Each input and output has a LED for visual indication of its status. Power and error indication is also available on the device front panel. The PRM expansion modules feature removable I/O terminal blocks, which provides quick and easy device replacement. The above-described Extension Modules can be selected and ordered here.